Looks like it. 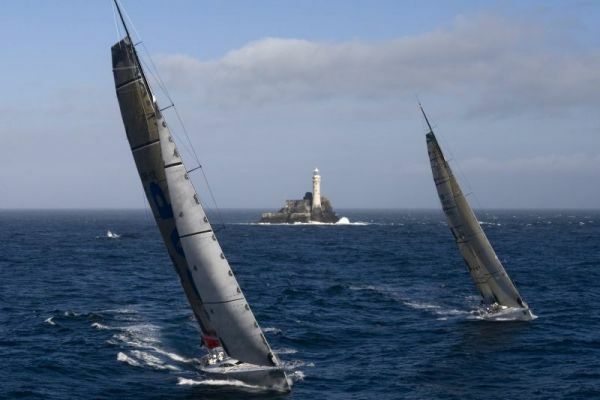 Ger O’Rourke’s canting keel Cookson 50 seems set for has taken overall victory in the 2007 Fastnet race. At 08h 58m 53sec local time, Mike Slade’s new 100-foot super maxi crossed the finish line off the Plymouth breakwater under spinnaker, breaking the Rolex Fastnet Race monohull race record that has stood since 1999. With an elapsed time of 1 day, 20 hours, 18 minutes, the Bruce Farr-designed ICAP Leopard (GBR) chopped just under 9 hours off the record set by Ross Field on the 80-foot RF Yachting. Wind was southwest at 10-15 knots as the boat finished in a light rain and reduced visibility. Only 10 miles behind was George David’s 90-foot Rambler (USA), finishing at 09h 43m 21sec and also well within the previous record time. The two boats rounded the rock just three seconds apart. I’m glad to see the comments are working. Nice blog!